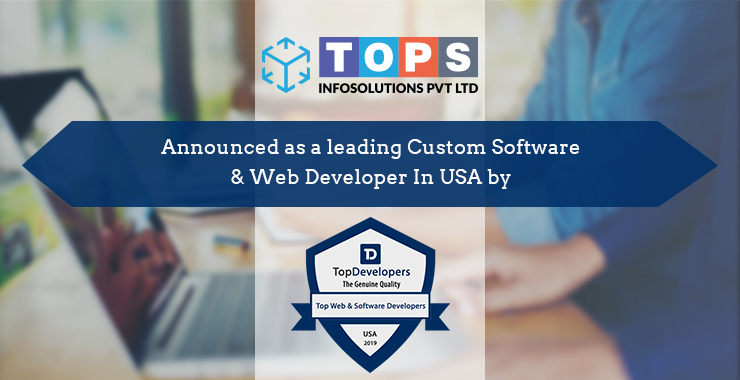 Our big news today is all about TOPS Infosolutions being chosen as a proficient Web and software developer, by one of the popular mediums to promote the IT service firms, TopDevelopers.co. The recent Press release of the TopDevelopers.co gave us a proud recognition and titled us as a client-friendly and productive web and software developer in the country! The press release was to honor the notable web and custom software developers whose potential has been evoking new business and brands. The article brings to light the teams with a technical skill set and capability to shape any mere idea into a profit-making business source. The actuality of intelligent software development lies in the expertise of the teams involved in developing the projects. TOPS Infosolutions is one of the reliable service providers with 8 years of expertise in the core area of software and web development and other related services. The team TOPS Infosolutions is an in-house team with talents to develop projects from start to finish. Our team work has proudly introduced many successful brands and businesses to the world. Our painstaking measures to attain perfection in our efforts have offered the results and made our client’s choice valuable. With a team of 150+ dedicated developers, software professionals and technical experts, TOPS Infosolutions, is a well-known name in offering trustworthy IT services. Apart from web and software development, we also provide effective Mobile app development, Enterprise Mobility, CRM Development, eCommerce/Retail Solutions, BLE Solutions, IoT Solutions, ReactJS, AngularJS, NodeJS, as well as Laravel development services. Our clients are much satisfied with our service, and their reviews help us reinforce our brand value and credibility. Our accumulated awards and honors are not for our promotion, but they emphasize our hard work and signs of motivation to deliver the best result for our clients. Our ultimate aim is to offer our clients an innovative, effective yet receptive technical product that will make them successful eventually. Our portfolio and our works are the testimonials of our excellent technical knowledge. We interpret the client needs and the business needs thoroughly to get an overall outcome. Our research and learning sessions make our developers sharpen their intelligence in dealing with crises and complexities that arise during project cycles. Our friendly approach and integral propensity to actively mobilize businesses through technology have gained this appreciation from the TopDevelopers.co, a mention on their press release, which has listed the top and efficient web and software developers in the UK, USA, and India. TopDevelopers.co is grasping the attention of IT firms for their impartial promotional activities, realistic approach towards the companies and reasonable services that will add to the brand value of their clients. TOPS Infosolutions’ profile on TopDevelopers.co is a productive initiative for our business development, and their process is quite inspiring! The representatives of TopDevelopers are friendly, and the support team is approachable any time. They communicate well, listen to the clients’ plight and make sure that the technical or the non-technical issues resolved in time. TOPS Infosolutions feels that the TopDevelopers.co carries its goals and promises remarkably well and we wish them to continue their excellent service! TopDevelopers.co is a directory and review platform for IT service providers. They are offering an unbiased service by listing the genuine and highly professional IT firms that can help the service seekers better through quality technical services. The research team of TopDevelopers chooses the best firms by filtering a vast list of companies and introduces only the competitive names to the businesses, enterprises, and entrepreneurs to partner with. The company has a friendly team of researchers and a hassle-free communication system. They provide the listing service for various technologies and services, which makes it a one-stop destination to find your perfect technology partner.